Husband Walter and I were finishing up our final walk-about of a recent visit to Savannah’s historic district when we happened upon Clary’s Cafe just in time for lunch. Clary’s at the time of the John Berendt book Midnight in the Garden of Good and Evil was a cafe and drugstore. In the non-fiction chronicle of scandal, murder and Savannah society, Clary’s is a major cog in Savannah’s rumor mill. It introduced readers to Luther Driggs, a regular at the diner and an embittered inventor who, among other eccentricities, glued strings to live flies as an anti-boredom strategy in his day job. The drugstore part of the operation was no more, but the counter seating and small-town diner lives on. Walter and I split the half-pound Clary Burger. 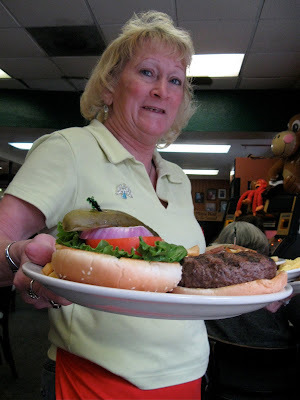 Our waitress Ollie Zudor embodied the best of Southern diner waitresses, friendly, speedy, competent, and longsuffering. I’m sure about the longsuffering part. She didn’t have a meltdown when I asked her to wait to set our meal down until I could get the photo above. What you don’t see is that in her left hand (and arm?) she was balancing two heavily loaded plates for another pair of diners. 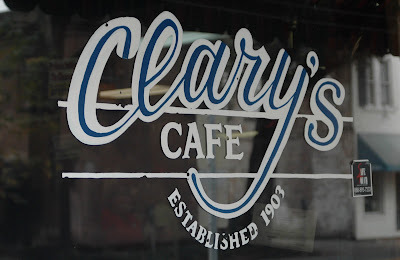 We left Clary’s with full stomachs and good memories.